Drop by Tea House to have a short rest, tasting various tea and buy some if you like. Move on to Temple of Heaven where the empeors worshiped heaven for good harvest. Today we are able to witness the majestic Great Wall. The Badaling Great Wall is the most popularly visited section of Great Wall. After lunch, head to the Ming dynasty imperial tomb cluster, we will visit the ancestral tomb-Changling of Ming Tombs. Drive back downtown and drop by Jade Factory to see how rough jade stones are carved into delicate jade products. Finally pay an exterior visit to the Bird’s Nest and Water Cube for photo fun. After breakfast, you will take a visit to the magnificent imperial garden-Summer Palace. Move on to the old Hutong area to take a relaxing Hutong rickaw trip along the old Beijing neiborhood. You will have chance to pay visit to local Hutong family, learn to make Chinese dumplings and have Chinese lunch together. Have bargin fun in the Xiushui Market, favored by tourists for hunting cheap and good products. Drive to Terracotta Warriors. 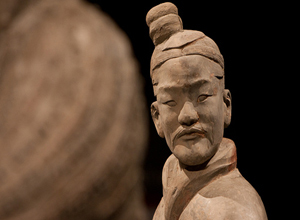 Hundreds of real-size army has guarding the tomb of the first Chinese emperor for more than 2000 years.The drop-by visit to the Xan Art Pottery Factory gives you oppotunity to buy copies of Terracotta Warriors and Horses as souvenirs. Afternoon stroll at the Huaqing Hot Springs, used to be the winter resort of Emperor Li Longji and his concubine Yang Yuhuan. Their love story is so moving. Take a visit to Shaanxi Historical Museum, a first-rate museum displaying 5000-year Chinese history. See the symbolic Xian attractions-Bell Tower and City Wall. It is popular to cycle on the top of the City Wall (surcharge). The Big Wild Goose Pagoda is a beautiful Buddhist building that houses valuable Buddhist relics. Transfer to railway station and take on overnight soft sleeper train to Shanghai. Pick you up from Shanghai railway station by our private tour guide & driver, then refresh yourself at local restaurant. We will visit the most famous Shanghai attractions. Stand on the Oriental Pearl TV Tower to have an amazing panorama of Shanghai. Stroll in the Yuyuan Garden to appreciate the beautiful design and layout of classic south China gardens. Visit the advanced Shanghai Museum, probably the best museum in China. The bustling Bund and Nanjing Road are the must when traveling in Shanghai, where you can find the traces of Shanghai’s past by the various foreign buildings and have ultimate shopping fun. Free time before departure; be transferred to airport and fly back to your hometown. Wish you a pleasant journey home! *Soft sleeper train tickets: Beijing-Xian, Xian-Shanghai. Your tours sound great, but I think they must be expensive if price is not published on website. Can you quote me a price for the 11-Day China Impression Tour and the 8-Day China Train Trip. Hi, may I have the rate for a party of 4 people and when are your tour start dates in may and jun. We just sent an email to you regarding your questions, please check.